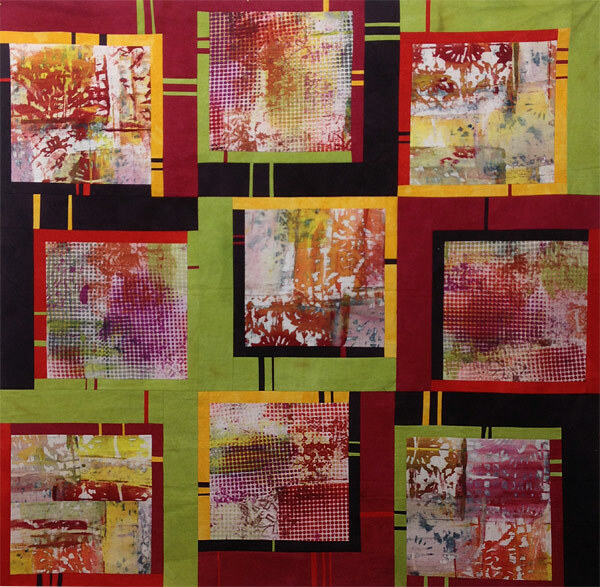 Description: An Improvisational Piecing workshop that modernizes the idea of a “Log Cabin” quilt. Using large 10-12 inch squares the student will piece 1.5 and 3.5 inch strips of solid color or neutrals around each square, inserting prints and alternate colors into the strips to create a large “unit” of 9 pieced blocks. This is the basis for a quilt top with a large negative space, a throw quilt, or even a baby quilt. It all depends on what the student wants it to be! Workshop will include time for discussion on adding the borders/negative space outside class. Supplies Needed: Students choose at least 12 squares of a bold graphic print, preferably one that has no distinct “right side up”. Blocks should be one size, either 10 or 12 inches square. Students must bring a minimum of ½ yard cuts of 3 solid colors that coordinate with the chosen print, or 3 neutrals that are different values (light, medium, and dark). Optional but encouraged: 2-3 fat eighths of coordinating prints (small pieces will be used as inserts into the pieced strips). Rotary cutter, ruler, and mat large enough to cut strips, scissors, nippers, sewing machine thread (neutral color is best). Sketchbook and pen for notes (optional). Workshop Room Requirements: sewing machines for piecing, 2 irons and ironing boards minimum (more is better! ), cutting mats, rotary cutters, rulers, if possible.